Joel didn’t want to ride out to Starved Rock Bluffs, let alone climb them, but Tony wouldn’t leave him alone. He talked his dad into giving him permission, hoping the whole time that he wouldn’t succeed. But his dad said yes, and the boys set off on their bikes, and Tony stopped at the bridge over the river. Tony went into the river. And Tony never came out. 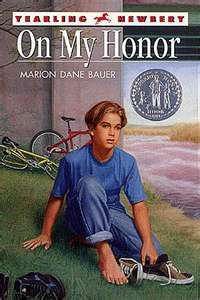 On My Honor was recommended to me by a couple sixth grade girls, but I didn’t care for it, even though it won Newbery honors. The prose is beautiful, the thoughts deep, but it was too depressing for my tastes. The book is extremely short with a singular, gut-wrenching focus that, in my opinion, eclipses the story. How bleak! I don’t enjoy this sort of melancholy, and I could certainly find a more comforting choice if it became necessary to broach this subject with my kids. It does sound depressing. 😦 <- depressed guy) I don't mind sad things happening in a story as long as something good comes out of it. I agree. I need something hopeful or I go around looking like your depressed guy for the rest of the day. I was going through old emails deleting things, and saw this again. We are reading this book in school in my guided reading group. It is sad. We are at the very end of chapter seven. Do you like it? It’s well crafted, but I thought it was too bleak and over emotional. Makes me think of “Bridge to Terabithia” by Katherine Paterson. In it, two children create a magical imaginary world together, until one of them drowns… In terms of discussing death with kids, I don’t know that any book is really adequate. Only life experience helps us deal with the subject of death, and we never truly deal with it in my opinion, just learn ways to live with what we know and what we can’t possibly know. I agree that anything intended as a prelude to that kind of talk should include some kind of catharsis and an uplifting message, however contrived, but I’m not sure the absence of one would ruin my own enjoyment of a book. Hi Darryl. Thanks for stopping by. You’re right; adults aren’t equipped to deal with death, let alone kids. Heaven forbid I ever need to broach the subject. I liked “Bridge to Terabithia” a whole lot more than this one, but that doesn’t rank among my favorites either. Life has enough sadness. I guess I don’t like to escape to a sad place, too.